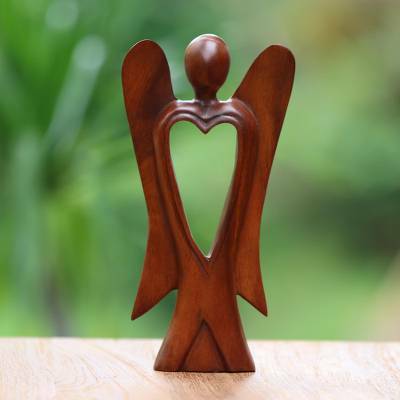 Hand Carved Wood Figurine of an Angel with Heart Feature, "Heart of an Angel"
Hand carved with a finish that showcases the natural beauty of the wood, this angel figurine from Bali's Nyoman Sudiana will enhance any home or office. A straightforward design conveys simplicity, serenity, and clarity of heart. Nyoman Sudiana has received 3 microcredit loans with 0% interest from Kiva and Novica, the first for $1100 and the most recent for $500. Proceeds were used to hire additional artisans from his community to work with him at his workshop. I absolutely love this angel with a heart. It is beautifully handcrafted. It was even more beautiful than I thought it would be. My brother had a heart transplant and this angel with the heart was perfect! An angel brought him a heart! I purchased this as a gift for the love of my life. She has been a angel to me in so many ways. It represents all the love and kindness she has shown me over the years. She loves it. This is a well made, attractive wooden angel that looks good displayed in any room in the house. This will be a gift for a dear, "open-hearted" friend, so I haven't opened the perfectly beautiful packaging. If the angel is half as lovely as the wrapping, it'll surpass expectations. I would order again from this gifted artisan. "Perfect For Staff Appreciation Gift!" We purchased this as a way to thank a staff member who has been with us for 16 years. We're a non-profit that focuses on the relationship between children and caregivers, so the angel and heart work perfectly! This is our second statue from Novica that we have used in this manner, and it certainly will not be our last! Bought for my sister, when I mailed it I didn't know she was coming from the hospital with a heart issue. She said it cheered her up, and felt like I was sending her a message to get her heart healthy. She told me she put on her dresser and looks at it all the time! "My family is a group of carvers who have worked in wood for many generations, so I studied carving with my father and my brother…." "Hi, I am a woodcarver from Bali. My name is Nyoman Sudiana and I was born in August 1969. My family is a group of carvers who have worked in wood for many generations, so I studied carving with my father and my brother, Madra, from the time I was in elementary school. "Buddha, traditional and abstract figures are my source of inspiration. Suar, hibiscus, ebony and crocodile wood with natural finishes are my common materials. In order to make or create a new design, it takes me about one and a half months to refine my work little by little until I get the perfect design." Twenty years ago, I fell in love with a beautiful full-size carving of a Komodo dragon I saw in Ubud, while backpacking around Bali as a student. Sadly, I could not afford it, so passed on. I've always thought about that beautiful sculpture with regret until I saw this miniature version on Novica. It has just arrived in the mail and it is wonderful. The intricate details are perfect - a beautiful piece of art from a very talented artist. I could not be more pleased - I will no longer regret the piece I couldn't buy, but instead will let this piece be my new reminder of my great trip to the beautiful Bali. Thanks, Nyoman!